Family Web Log, Again. : Walden, we have you surrounded! Walden, we have you surrounded! So, it seems we did this. The site of the ironically famous cabin is situated somewhere generally behind Selena, on the other side of the lake. Almost-obelisks mark outline the original cabin and woodshed locations. If by some sad circumstance you are not familiar with Walden, by Henry D. Thoreau, know that it is an intensely introspective book of social criticism, and nature appreciation, written by a dude who decided to try an experiment in living as simply as possible, in the mid-1800s. Thus he went into the woods (the book is, in fact, alternately titled Life in the Woods), near a small lake, not terribly far from Boston, and built himself as basic a little structure as he thought would suit his personal needs, and attempted to just live (and write) as worry-free as possible for some years. He wasn't a complete hermit: he was near enough a town to walk there and get supplies when needed, but he did try to be as self-sufficient and frugal as he deemed reasonably possible. The idea was not to be a ascetic and isolated, but rather relatively independent and reflectively consistent. 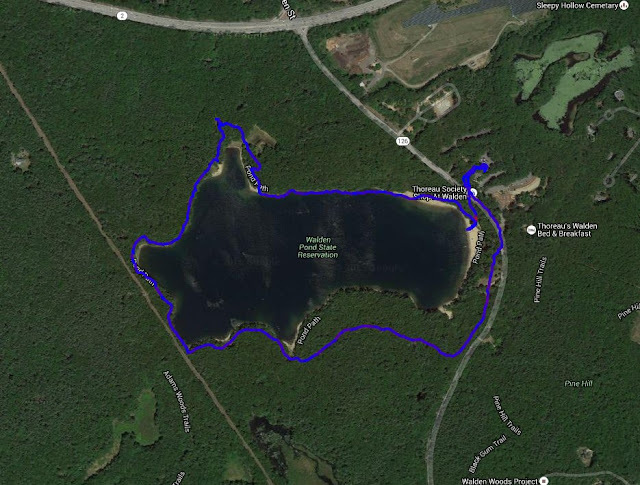 So it is somewhat ironic that this once-secluded pond, site of Thoreau's reflective solitude and simple life, is now a place of pilgrimage for many, with sizeable parking lots, and many carefully controlled, fenced, narrow pathways. There is a gift shop/bookstore. But we can't be too critical. We too parked. We too trampled through the lovely corrals. We too were curious and just wanted to be able to say, feeling some sort of transcendental emotional connection, we walked near where this book was birthed. We were not, however, among those who felt the need to leave an inscribed stone (there is quite a pile of them near the original cabin site), but we understood the sentiment, no matter how ironic the act might seem to be. The man himself, looked a bit perplexed over the whole thing. So I comforted him with my apple. But he continued to seem perplexed by it also. Disoriented. So, as he seemed not ever to be going to eat it, I took it back. I munched it while walking his trails. I left the core, as my offering, to simply nourish the woods.